The Tabla is an ancient instrument used throughout the Middle-East. 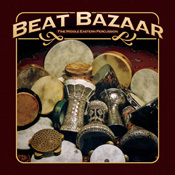 Beat Bazaar is a collaboration of the worlds finest Tabla professionals presenting the art of Arabian percussion. The featured drummers are: Gamal Goma, Sayed Madbouli, Eddie Kochak, Hamdi Al-Khayyat, Khamis Henkish, Seyyid El Masri, Mohamed Bakkar, Sayiid Rakak, Ahmad Al-Tabbal.